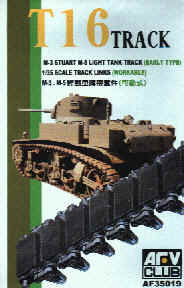 These two new track sets are for 1/35th M3, M5 Stuarts and the M8 HMC. 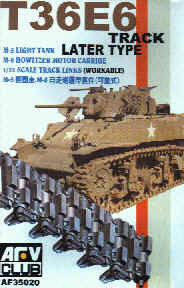 Set AF35019 T16 rubber block track can be used on any of the three vehicles. 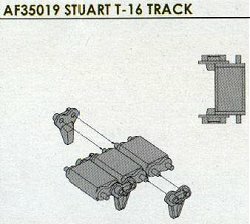 Set AF35020 T36E6 steel cleat track is suited only to late model M5A1s and the M8 HMCs. As both track sets are the same apart from the shoes themselves, these comments apply to both, except where noted. The sets come with 6 sprues with individual pads and end connectors. The end connectors, which have excellent detail, simple, clip onto each pad to join together and form the track lengths. No glue is need as friction and tension holds the links together. You can of course, run some liquid cement along the joints once the track is fitted to the model to make sure they dont come apart. The drive sprockets on the Tamiya kits need adjustment by removing the small raised rib from the inside of each sprocket, to allow the links to sit properly between the teeth. As with any individual track set, its a bit time consuming to separate the parts from the sprue and fit together, but compared to the rubber band tracks in the Tamiya kits, the end result is well worth it. The only "problem" I encountered was that each rubber pad in set AF35019 had a small indentation in the middle of each pad. I wouldnt exactly call them sink marks, but enough to show. This was easily fixed by using an X-ACTO #11 blade to shave a small portion off to smooth the block. This was easiest to do after the links were fitted together rather than try and hold each block separately. This all added to the time to finish the lengths, but in the end also gave a worn effect to the finished pads, so all was not lost. The instructions call for 66 shoes to make each length (per side), but I found that only 65 were needed for a perfect fit. They also fit beautifully around the drive sprockets, these links have obviously been tailored to the Tamiya Kits as you would expect. One final comment is that I have not seen any photos of M8 HMCs in service using the steel cleat track, only the rubber block track. There are a number of wartime photos showing late M5A1s with the steel cleats. The steel cleat tracks gave improved traction on icy and slippery surfaces, but added about half a ton in weight to the vehicle, so were only used when needed. Also when steel cleat track were fitted the grousers usually carried on the turret sides were not carried. 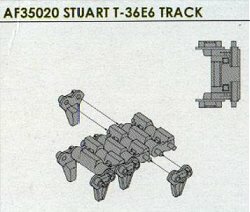 In conclusion, I would highly recommend these track sets if you plan to build any of the Tamiya Stuarts, the final appearance is excellent and really add to the kits. This Page Created on 16 December, 1998.